We are BarDew Valley Inn, a family-owned and operated bed and breakfast located just outside Bartlesville, Oklahoma. Our Inn is more than just a bed and breakfast. It was a place built on ideas and opportunities becoming realities. ABC’s Extreme Makeover: Home Edition with Ty Pennington saw potential, and so did we. This home was originally built for the White Family in 2006 by Ty and his team, a product of work from over 1500 volunteers. In 2018, this diamond in the rough turned into a new home and became the BarDew Valley Inn. Where they saw the potential for something greater, we agreed; we made it into something not only for ourselves but for others. This Inn attracts visitors and nomads from all over the US, not only due to the uniqueness of our Inn itself but due to the surrounding activities and cultural events. Your experience here can be tailored to whatever you are looking for, whether it be an adventure amongst friends or a romantic getaway. We have four themed suites which cater to an array of visitors and their likes. Our visitors come from all over the United States, and always find a way to make their experience their own. We are within driving distance from Dewey, Pawhuska, downtown Bartlesville, the Price Tower, Woolaroc Museum and the Pioneer Woman Mercantile. In the middle of a small town, we offer a one-of-a-kind experience. Come stay with us! Experience laid-back elegance and serenity. BarDew Valley Inn provides a relaxing and comfortable retreat for those who are visiting in the Oklahoma Green Country area. Each of our suites is perfectly-sized for a couple seeking a romantic getaway, a business traveler that wants a change of pace or a couple of friends headed to visit The Pioneer Woman Mercantile. We have four uniquely designed suites (with the 5th in the works) from which to choose each with its own private bathroom and patio. Each room features elegant and extra-cozy accommodations. At BarDew Valley Inn, you will delight in exceptional service, slumber in elegantly themed and immaculately clean suites, and treasure privacy. Each suite has a private exterior entrance, so that you may come and go as you like…even late into the night. Moreover, the next morning, at 9:00 a.m., a scrumptious breakfast will be prepared for you in our dining room. We often serve Eggs Benedict, French Toast, Breakfast Sausages, and Bacon, Sweet Potatoes or Country Potatoes, Biscuits and Gravy, as well as fresh fruit, Supreme Roast Starbucks Coffee, and Orange Juice. Our menu varies, so check with the Inn Keepers upon arrival. Amenities include: Free Onsite Parking, Full Use of Grounds and Common Areas, Theatre Room, Outdoor Kitchen with Grill, Fishing, Bird Watching and much more. Children 12+ of age permitted with adult supervision. We offer detailed assistance to our guests on restaurants, attractions, hiking, maps, entertainment, etc. Looking for a venue for your wedding, a special party, or reunion? Maybe you'd like a special place for a meeting, training seminar, or fundraiser. We offer a beautiful picturesque setting near a tranquil pond with lots of open space for a tent, wedding, band, and more. You can rent just the grounds, just the Inn, or both! The property sits on over 14 acres with a large pond and areas to hike. We are just a short drive from Bartlesville, Dewey, and Pawhuska. There is so much to do within a 30-mile area around our Inn. There is something for everyone. Come experience a getaway within a getaway. We have four uniquely decorated rooms from which to choose each with its own private bathroom and patio. Each room features elegant and extra-cozy accommodations. From the Big Apple to the Big Easy, the Wild West to Sleeping Beauty's Castle, each of our rooms is a destination in itself. Come experience a getaway within a getaway. All our rooms come with great amenities! We offer a complementary breakfast to all our guests. We often feature local baked goods, bacon, ham, eggs, french toast, quiche, oatmeal, cereals, juices, Greek-style yogurt, seasonal fruits, and all you can drink coffee and tea. Our menu varies daily. *It is very important that if you have any special needs or allergies regarding your diet, that you let us know ahead of time. For lunch and dinner options, check out Beth and Perry's favorite local restaurants. Thank you so much for opening your beautiful property to us this weekend. We had an amazing time, with equally amazing people. It is so peaceful and breathtaking. Beth and Perry are wonderful hosts! I honestly didn't want to leave. See you next time and thanks for the memories! Beth and Perry are amazing hosts! You will not regret staying here in any of their updated and beautiful theme rooms. They go above and beyond to make you feel at home during your stay. Great people, and awesome getaway spot for the family! For a relaxing getaway, BarDewey Valley Inn is the place. Beautiful home and better hosts, Perry and Beth were so lovely. Each room has its own theme with private bath and patio. Breakfast each morning was delicious! Already planning our next trip! 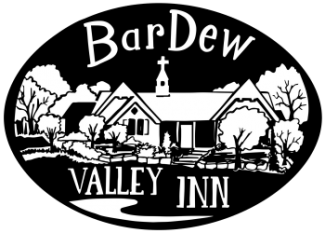 BarDew Valley Inn was a great place to rest for the weekend. The place is beautiful, spacious, and Perry and Beth are amazing hosts. The themed rooms are artfully decorated and the private bathrooms are top notch. We enjoyed shopping in B'ville and Pawhuska. Can't wait to come back!